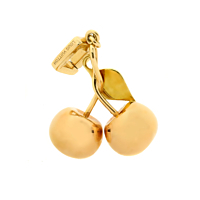 Putting the "charming" back into "Charm," this cute Louis Vuitton Cherry Charm aptly demonstrates that designer jewelry can be every bit as fun as it is beautiful. Two 18k Rose Gold Cherries with 18k Yellow Gold stems bear large smiles on their faces, which are composed of both glistening Yellow Sapphires (for the smiles) and stunning Blue Sapphires (for the eyes). One of our favorite Charms ever!